This is a great and simple meal replacement smoothie for breakfast with lots of protein. It’s a meal in a cup. There is a whole LOT of fiber in this smoothie and that is what balances out the carbs. Because of the fiber, your blood sugar won’t rise like it would if you were just eating pure sugar. This recipe is also full of nutrients, like potassium, vitamin C, vitamin A and vitamin E.
You can use plain yogurt to cut out even more sugar and carbs, but you’ll want to add a low carb sweetener, like stevia, if you want to replace the sweetness. You can also add vanilla protein powder if you would like more protein. 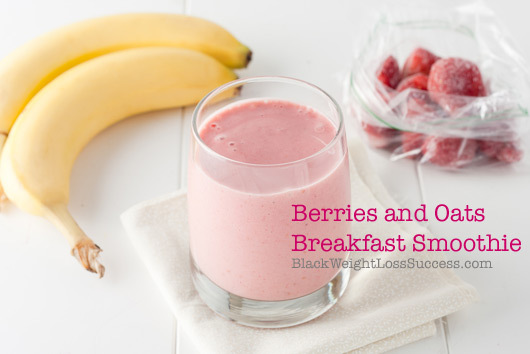 A great breakfast smoothie with berries, oats and greek yogurt for a complete meal in a cup. Add the water and greek yogurt to your blender first. Then add the oats and banana. Blend until smooth. Add a bit more water if the mix is not blending due to the thickness of the mixture. Taste to make sure you've achieved the desired sweetness. If you want to use fresh berries instead of frozen, that’s fine. Frozen berries can be a bit more affordable. Just add a few ice cubes to chill the mixture. Freeze the other half of the banana and use it with your next smoothie. Find the brand of vanilla greek yogurt with the lowest sugar. I used Oikos at 11 grams per cup. The agave or honey is optional. Omit sweetener to reduce the calories and carbs in this recipe. The banana and berries will actually make the smoothie sweet. If you prefer, you can add a few drops of Stevia for a low carb boost of sweet instead.